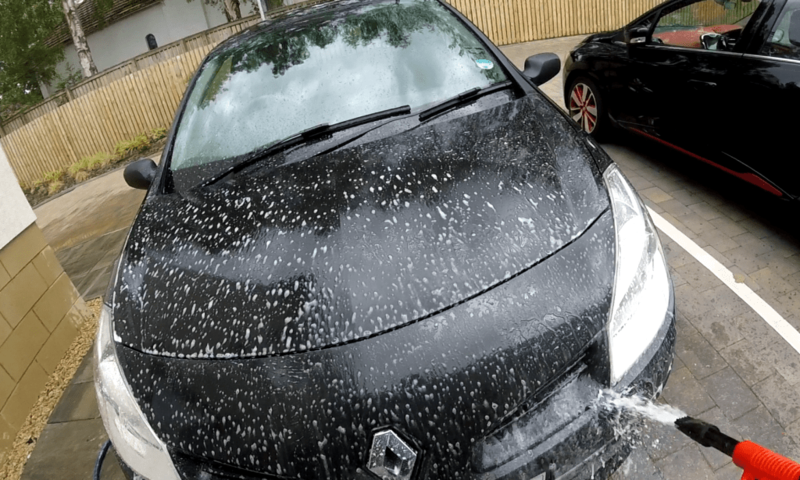 When it comes to car detailing, a crucial step depending on how dirty your car is, is to perform a prewash on the car before applying washmits to it. The reason for this is that not doing so can cause dirt that is engrained into the paint to be dragged along it causing the much dreaded scratches and swirls. However a lot of people don’t have a pressure washer so they may think that they can’t carry out a prewash but this isn’t the case. There are now a plethora of options available for those that have a common garden hose that want to carry out a prewash on their car. When it comes to the Chemical Guys Foam Gun, it is extremely easy to set up and use. It comes included with a detachable nozzle for easy cleaning, as well as a 90oml tank. On the tank there is a dial ranging from 0-5 which dictates how much foam comes out. Obviously 0 is no foam and 5 is full foam. There is also a water gun attachment which connects to the foam tank by the means of a pull back mechanism. The benefit of this is that it is able to securely lock the two parts in place and they cannot become undone unless you pull the mechanism back. There are also a range of different adapters for you to connect your hose to the water gun, although the one that is already in place on the gun should work for the majority of people. The whole unit is well constructed from high quality materials including plastic and brass, and even after dropping the gun on concrete by mistake, it still worked perfectly. In terms of the foam it produced, I had used Autoglyms Bodywork Shampoo Conditioner which I had already reviewed on this site. By default, this doesn’t really sud up due the the rinsing agent in it. Despite this you still get a fantastic wash with it. After using it in the foam gun, it created a nice foam that you could easily use in order to lift off light road dirt and traffic film from the car, which is exactly what I used it for and it successfully helped to pull dirt away from the car before giving it a more thorough wash. It would also be possible to use this foam gun with the Autoglym shampoo conditioner by spraying it directly into the wash mit and then running this over the surface of the car. I would highly recommend the Chemical Guys Foam Gun due to its excellent build quality as well as the foaming effect it was able to produce from a shampoo which doesn’t otherwise create long lasting suds. I have no doubt that if you were to use a specific snow foam product, or even a foamy body shampoo such as Meguairs Gold Class that you would get even better results from this foam gun. When you consider that it’s significantly less than even a foam lance for a pressure washer (before you factor in said cost of a pressure washer) and you’re able to get great results from it, it really is a must have purchase! If you don’t have (or don’t want to get) a pressure washer, the Chemical Guys Foam Gun is an amazing way to safely remove excess debris off your car. This cheap and effective method can make your paint looking better, for longer. Highly recommended.